This is the 5th follower appreciation giveaway. Thanks so much to everyone who entered the giveaways over the last three days, and a big welcome to my new followers! Let's get right to the goods... More fabric! Interested in Joel Dewberry's Heirloom line? Make sure you either leave an email address in your comment or that your email is attached to your Blogger profile. If I don't have a way to get in touch with you, I will choose another winner. This giveaway will be open until 11:59pm (EST) on Sunday, November 20th. The winner will be chosen using a random number generator. I will announce the winner on Monday, November 21st, and they will have until Wednesday, November 23rd at 7:00am (EST) to respond before I choose another winner. I love this fabric. It has been on my wish list. I like both. I don't like it when everyone has the same thing as everyone else, so I like it when things are mixed up. I like to use both, white lights outside and colored lights on the tree or white on trees and color outside. Oooo love the fabric, thanks for the giveaway! I am a white lights kinda girl. Inside and out! Such beauty in one bundle! As child I loved multi-colored Christmas lights, but now I prefer white. I did have multi-colored when my kids were small, with multi colored Christams decoration. Such happiness! I'm white lights all the way! I love mixed colors...it's more Christmasy! yay more goodness for us! enter me please! I love color, but definitely white on the porch! Gorgeous fabrics! I'm white lights on the tree and white & red lights outside. I like white lights indoor as well as outdoors for a more traditional look. I'm going with multi-colored lights. It was a tough decision, though! THanks for the giveaway! I have been wanting some of this fabric for the longest time... crossing my fingers that I win! I have to say that I love the look of white lights. I have a thing for white lights. I especially love my twinkle ones. 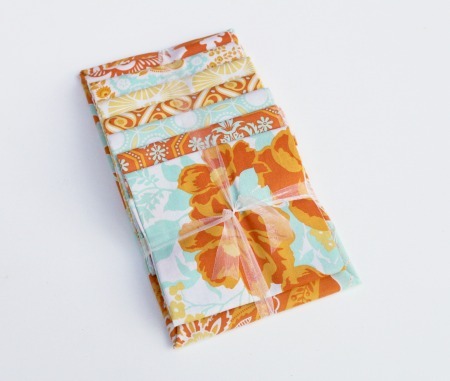 I have been wishing for this fabric line for a while...thanks for the chance to win! Oh I love this fabric! It's so hard to chose lights, I think I prefer white but multicoloured just feels so festive and homely. I'm going with multicoloured!! Beautiful fabric! I only use Christmas lights indoors and I prefer them white. White Lights! Inside & out! Beautiful fabric. I use white / yellow/ lights only! Like both lights but usually put colored outside and clear inside. Thanks for hosting a giveaway. I LOVE these!! pick me pick me!!! Love these fabrics! I am not usually an orange person, but these are so pretty and as soon as I saw them I wanted some. As for lights, I like white. We don't do the whole Santa thing, so we have Winter Lights and white is best at our house. I think there is room for either..depending on the circumstance. I think all the little light are beautiful and would like to have them on all year. Love them draped over trees and hanging in waterfall configurations, they can be such fun. Thanks for the giveaway too! I prefer the white lights - they just seem to be much more serene. I do follow your blog thru Google Reader. Thanks for the giveaway. I like colored lights on my tree and white icicle lights outside. Have you tried both white and multi-colored on your tree? Really sparkles! We do multi on the outside of our house. I love the the fabrics in the giveaway and my daughter's favorite colors! We have coloured lights outdoor, and both on the tree. And I follow. THANKS for the chance at that beautiful bundle! Ohh, great question! For the outside, lots of colored sparkle lights! For the Christmas tree, usually white lights! Maybe we should switch it this year? As much as I love color, when it comes to Christmas lights I'm definitely a white light kind of girl. When I lived in Germany, pretty much everyone just used white lights - it was my idea of Christmas heaven! I love white light.Thanks for the chance to win another lovelyness! What a beautiful bundle of fabric! Thanks for the generous giveaway. I love white lights. We have been switching them every other year, and I do like the multi outside but one colour for our indoor tree. Thanks for the chance!! I have multi-colored lights!! Thanks for the giveaway!! Great fabric by the way! Growing up, we always had multi-colored lights, but hubby grew up with white, which we've stuck with. Personally I love both, but have really enjoyed the white the past few years. I also really like the blue & white strings. Colored lights on the tree and in the window (we live in an apartment so no outside lights). All of your give aways have been so great! Love the giveaway!! Thanks for the opportunity!! I'm a follower! I love white lights indoors and outdoors... also a sucker for blue lights, because we never had them growing up. I do clear lights inside and out. i use solid inside and multicolored outside! thanks! White lights - lots of fun colored ornaments! LOVE these colours. Thanks for the chance to win! I'm a follower.....multi out, white in. I always like multi-colored lights...they seem so warm and cozy! Great giveaway, thanks! I am a follower who is all about the white lights on the Christmas tree, but I like Red Green combos on my bushes and green and or white in the trees. If I am forced to choose, it is white all the way. Congrats again on 100+ followers! I like multi colored lights on my tree and outside. But my light strings of snowflakes and stars have to be white. I am a WHITE kinda girl, keep it classic for me! Those fabrics are so drool-worthy! I have always been a white lights everywhere kind gal, but just this last year started feeling like it was a little boring. I don't know if I am ready to replace all our lights though. I love the white twinkling lights best! Definitely WHITE! Thanks for the chance to win! I like solid white and solid red, mixed together. But we do have 1 strand of multi-colored lights that my 8-yr-old won't let me get rid of!! I prefer white lights! Thanks for the chance to win. I would use both colored and white lights but since my husband hangs all the lights inside and out, I let him decide. He likes all white lights. We have two huge evergreen trees on our front lawn that keep growing. We truly need a cherry picker truck now to hang the lights on them.....but that isn't happening. Thanks for the chance to win this beautiful fabric. Thanks for the giveaway fun! Both. We do white lights on the outside of the house, however I love having the multicolored on the tree and inside. I'm loving your questions. This question is controversal in my house. I like white, my husband likes blue! Who the heck wants blue lights?? Funny true story, my neighbors went out and bought blue lights, and plugged them into my all white christmas lights outside. I dont always drive past the front of the house so it took my a few nights to see what they were up to! So, then I unplugged the blue lights and snuck back over to their yard and added them, to their light display! I like both, we have a tree that we put upstairs with white lights and nicer ornaments and one that we put downstairs with colored lights and all of our fun old mismatched ornaments. why choose? I have both on my tree! I like multi coloured lights. Steady not madly flashing! I adore this coloryway!! I am a White lights indoors and do both outdoors. Thank~you for all the Give Aways, they are all fantastic!! I love the serenity of all white lites and nothing else on a tree. It's my fave! I don't have any Heirloom and would LOVE some! I have multi colored lights! Lots of color on the inside, and definitely white lights outside. I love the glow of Chirstmas lights on the tree! Joel Dewberry? Um yes please! :) I am a multicolored girl. Love all the flashing lights on the tree. I love that line of fabric!! And I have to say, while I admire the white lights, I do love go for the multicolored lights most of the time. Oh I am very old school and love multicolored lights. Joel Dewberry I don't have any in my stash and would dearly love some. Thanks for a chance to win. I am an email subscriber under bimbi9 at verizon dot net. I'm just like you for the lights ... multicolored inside, white outside. And this after 7 year I finally have a power outlet on my porch so I can't wait to decorate ! We have all amber lights on our tree. Love the warmth it gives. Thanks!! I love white lights on Christmas tree. It depends on the year! Sometimes I want a crisp look, so I go with white, but sometimes I want to go all out Tacky Christmas style, and that calls for LOTS of color lights!! Love this colorway! I just signed up to follow. I agree with you on the Christmas lights. Definitely white on the outside and color on the tree. Although white on the tree can be okay sometimes. Thanks for the opportunity! I'm probably a white light girl. I put color in the accessories. Multi-colored lights, all the way! White lights are just so sterile. Plus so many businesses use them year-round that they just don't seem Christmas-y enough to me! Congrats on 1000 followers. I follow via Google Reader. So I like both multi-colored and white lights, but my hubby prefers white outdoors, so we do that. I think we usually have colored lights on the tree. Thanks for the giveaway! I think I'm a white lights girl. I grew up with the multi-colored lights, but for some reason I like the white better. It's weird because I like bright colors with everything else in life. Definetly multicolor...mainly for the kids! My favorite theme for myself are blue and white. I love the look of white lights inside and out. The sparkle of the white lights are so dazzling.... Like minature sunbursts! White in and out, thanks for the giveaway! We're definitely a multi-color family. It's funny how that question is so hotly debated! 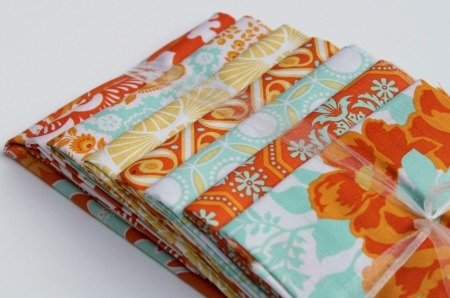 Thanks for the chance to win the lovely Dewberry fabric - it's one of my favorites! I'm a coloured lights gal, all the way! Great colours on those fat quarters! I like multi for my lights...we used to do white, but I think multi looks happier. The colored lights are my favorite. Probably because that's what my kids have always liked. I do love the white ones outside though. Good luck to everyone who enters. Lights: both! The more, the merrier! I'm a follower. Thanks for the giveaways! Multi-colored lights in the tree and on the house here, though we do sometimes put white lights on the bushes outside. Thanks for the great giveaway! I have an appreciation for both. :) I like white for hanging around the house and multicolored for the tree. Google finally cooperated and allowed me to become a follower = although I have been reading your blog for a while now. Bummed I missed the teapot pincushion giveaway, but excited at the thought of this gorgeous fabric. I like multi lights on my tree.